One of my favorite food genres is Chinese food. I wish Keith liked it too. He doesn’t. He tolerates it. He is a good sport though and 99.9% of the time will eat whatever I put in from of him. He’s a smart man. He picks his battles well. So imagine my surprise when he claimed to like this recipe. I was shocked and asked him several times if he was serious. I think he finally got annoyed with my twentieth “you really like it?” I loved it, obviously, but Keith was the real test. So chinese food that is Keith approved is a recipe that must be shared, duplicated and made immediately. Preheat oven to 375 degrees. 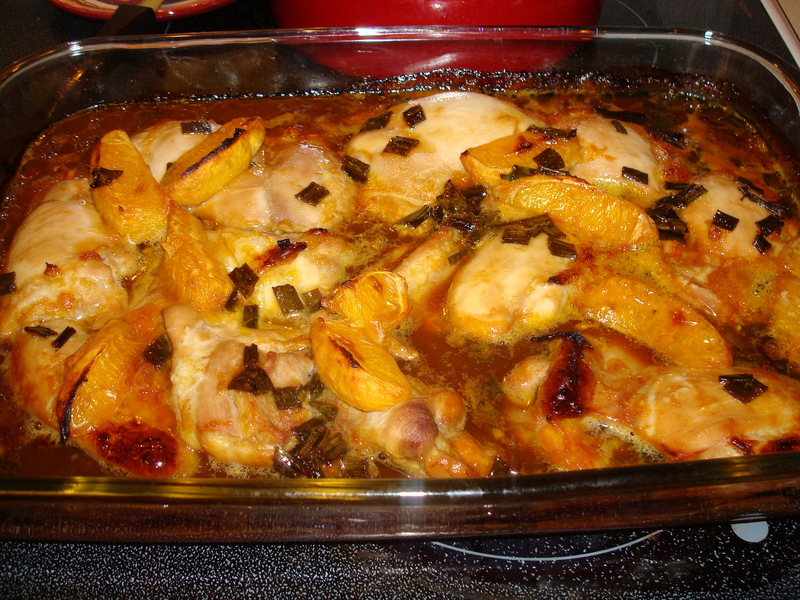 Place chicken in a baking dish; set aside. Heat oil in a small skillet and saute garlic and onions until soft but not browned, about 2 minutes. Add honey, orange juice, orange segments, and soy sauce, stirring evenly until honey is completely dissolved. Pour sauce over chicken. Bake, uncovered, for 45 minutes, basting once or twice, until chicken is cooked through. Serve over 1/2 cup brown rice and steamed broccoli, then drizzle extra sauce on top! Makes 4 servings. Chinese food is so delicious. I love it. Yummy. I love Chinese food — this looks really good Kelly! You know, I almost posted something today about things I learned on my road trip and the #1 thing on the list is that Chinese food can be good. Maybe it was the road trip, but I got Moo Goo Gai Pan with chicken, broccoli and mushrooms from some hole-in-the-wall place in Kayenta AZ, and it was DELICIOUS. I need to make this for my parents! I’m bookmarking all of your recipes because they all look so delicious! I made the peanut butter bread on Monday and it’s almost all gone… yummmm! Ooooh,,,,I am so glad you like the peanut butter bread! i need to make this for james when he gets home! 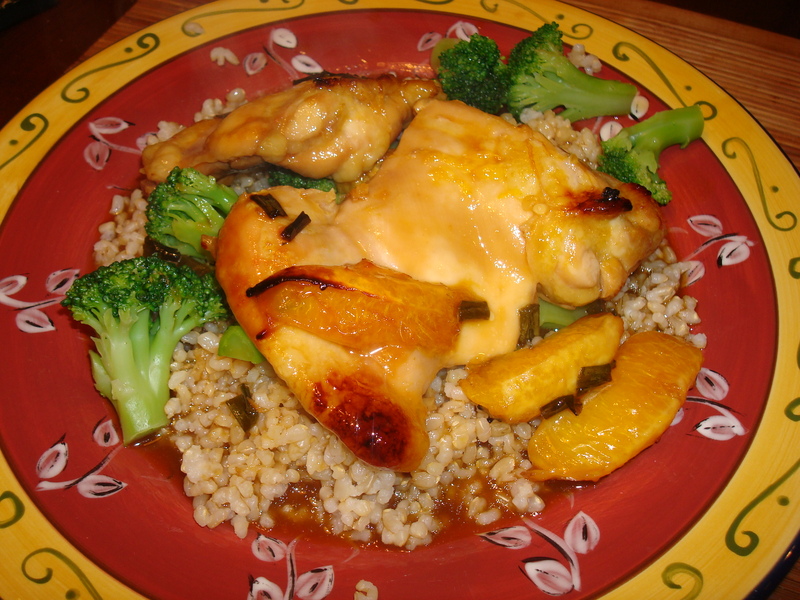 we love honey orange chicken! I LOVE chinese food. My husband likes it, but doesn’t share my adorement for the cuisine. I should try this one out on him. I love Grapeseed Oil…it doesn’t have any taste so it is perfect when you need to use an oil that doesn’t have a taste but can tolerate heat. When someone says they dont like Chinese food, I look at them as if they just hit the crack pipe. I would eat it every day if I could! I’m not usually a Chinese food lover either but my husband loves it, so when I make it for him he thinks something bad happened. haha I love new chicken recipes though so I’m gonna have to add this to the list. You reminded me of myself with the “you really like it.” I always do that to people when I make something I’m not sure they’ll like. This looks really good though! I’m going to try it next time I have chicken. I enjoy Chinese food, but my dad was never a fan- so I rarely got it growing up… maybe one of the reasons why I don’t eat it more than I do?